Someday I’ll have a real kitty again, but until then . . . I wanted to give credit to the designer but cannot find anything but Designed by caram. Think it was on Pinterest. Fabricland wanted $13 for a cushion insert so I went to a thrift shop and got a pillow that fit for $1.50. More left over for whatever else. That is so cute. Good idea to re-purpose that thrift store pillow. Absolutely adorable. Great idea to purchase a pillow at a thrift store. Wow! This is really cute! I love it and I'm strictly a dog person. Precious! Now go adopt a kitty please. Bench on my front porch always has a couple of pillows to match the season. Covered thrift pillows work perfect. Aughhhhhhh. What a sweetie. She is one happy kitty. Great pillow - all snuggly warm. Bet you smile every time you see it! Very cute! That is such a cute pillow. 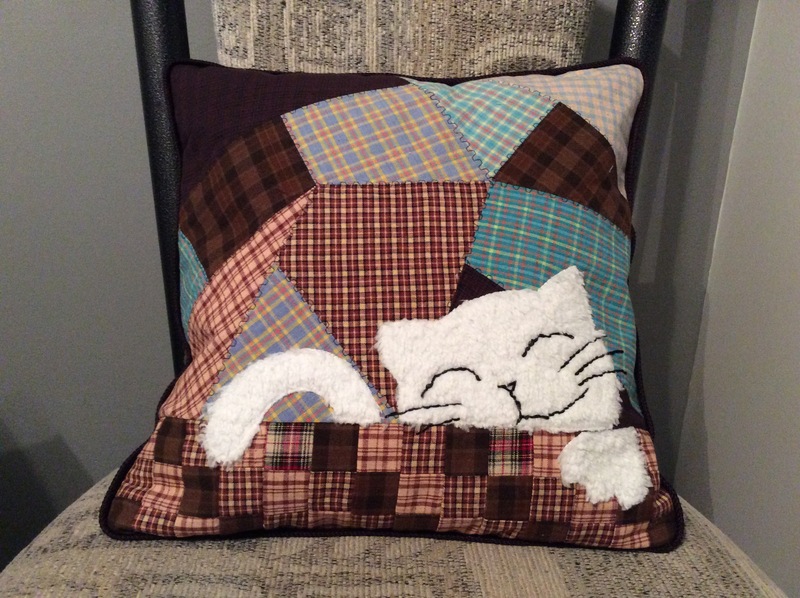 What fabric did you use for the kitty? I'm really enjoying seeing it sitting around, even pet it occasionally! The kitty is a fluffy knit back fabric that I've have for a few years, think it might have come from Michael's. It didn't really take well to the stitch witchery so had to stitch around the edges. Hubby says when we start staying home I can have a cat. I have a signed document! That brought a huge smile to my face. I love cats, but am too allergic to have them in the house, and they wouldn't last long outdoors (coyotes). You did an amazing job stitching the kitten's face. Enjoy your pillow! Love it, it's sooooooo cute . What a cute pillow. And an easy kitty to take care of. Darling. Oh, what a sweetie! And you don't have to feed it, clean up after it or clean its litter box. My kind of kitty. What a wonderful idea about going to the thrift shop for a pillow. I have some leftover fake fur, now I know what I am going to do with it. Thanks for showing us what you have done.